The Supermarine Walrus (originally known as the Supermarine Seagull V) was a British single-engine amphibian reconnaissance aircraft that first flew in 1933. It was designed to be catapulted from larger warships, such as cruisers, and used for reconnaissance and gunnery spotting (noting the fall of shot in both exercises and action and advising corrections by wireless telegraphy). It was the first British service aircraft to incorporate in one air-frame a fully retractable main undercarriage, completely enclosed crew accommodation and all-metal fuselage. Eventually 740 of this aircraft were produced and used by the Royal Navy, Royal Air Force, Irish Air Corps, Royal Australian Air Force, Royal New Zealand Air Force and from 1941 onward the Royal New Zealand Navy. The aircraft came in three variants, the Seagull V, Walrus I and Walrus II. In 1934 the Royal Australian Air Force (RAAF) ordered 24 Seagull V’s and they were delivered during 1935-37 and operated by 5 Squadron (later 9 Squadron, located at RAAF base Rathmines, as of 1 January 1939). In accordance with pre-WW II Australian procedures only the RAAF was permitted to operate service aircraft thus aircraft for use in the heavy cruisers HMA Ships Australia and Canberra and the light cruisers HMA Ships Hobart, Perth and Sydney were operated by the RAAF. The pilot and maintenance personnel (normally six men that also included a photographer) were also supplied by the RAAF but the observer (navigator) and telegraphist air gunner were naval personnel. The Seagull V / Walrus was known colloquially throughout the RAN as the ‘Pusser’s Duck’. Following the outbreak of war Walrus aircraft were also embarked in the armed merchant cruisers HMA Ships Manoora and Westralia. 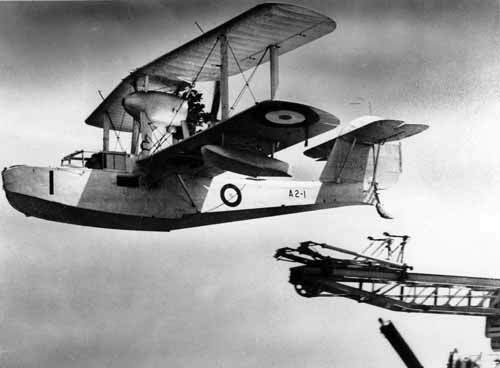 Walrus aircraft serving in Australian warships saw extensive service during the war. On 21 June 1940 Sydney, then operating in the Mediterranean, launched her Walrus for gunnery spotting duties during her attack on the Italian port of Bardia. During this activity a group of RAF Gloster Gladiators mistook the slow moving bi-plane as an Italian Fiat CR.42 Falcon and attacked the Walrus. The Walrus pilot, Flight Lieutenant Price, in turn thought he was being attacked by Italian aircraft. The Walrus was badly damaged but evaded its attackers and crash landed at a RAF airfield at Mersa Matruh with all three aircrew walking away from the wreck. In August 1940 the Walrus operating from Hobart, off the Horn of Africa, bombed and machine-gunned an Italian airfield at Zeila in Italian Somaliland. The following month, on 25 September, the Walrus from Australia was shot down by Vichy French aircraft during the failed attack on Dakar with all three aircrew killed. In late 1940 Perth arrived in the Mediterranean theatre and was soon in action. Her Walrus was put ashore at Suda Bay, Crete where it conducted general transport duties and patrols until damaged in action with Italian fighters. A replacement Walrus was provided by the Royal Navy but it was shot down over Crete on 28 April 1941 after a 20 minute running gun battle with two German Dornier DO 17 light bombers. Fortunately her RAAF/RAN crew survived the crash into the sea and were later rescued. HMAS Canberra operated in the Indian Ocean during 1941 and her Walrus took part in an action in March in which two German raider supply ships were intercepted and sunk by the Australian cruiser. Captain Farncomb, RAN commanding Canberra, wisely used his aircraft during the search for the suspected German raider and two suspect vessels were sighted and their location signaled to Canberra. Upon sighting the Walrus the supply ship Ketty Brovig took scuttling action - but this did not stop the Walrus from landing nearby and the observer, Lieutenant Claud ‘Mad’ Malleson, RN swimming across to the vessel to see if it could be salvaged. Upon returning to the aircraft Canberra was advised the Ketty Brovig could not be saved but the Walrus then captured the German crew in their lifeboats and awaited Canberra’s return. The Walrus in HMAS Sydney was lost when the cruiser was sunk on 19 November 1941 with the loss of her entire ships company of 645 men. At the Battle of Sunda Strait on the night of 28 February/1 March 1942 HMAS Perth was sunk and her third Walrus destroyed. Of the combined RAN/RAAF air and ground crew of nine men only three survived the action and three and half years as Prisoners of War. In August 1942 Canberra was lost at the Battle of Savo Island in the Solomon Islands campaign. Her Walrus was destroyed in the action and her pilot and four of her maintenance crew killed. In late 1942 Manoora and Westralia were converted from armed merchant cruisers to landing ships infantry and no longer needed their embarked aircraft. Following the torpedoing of Hobart in July 1943, which put her out of action for nearly 18 months, only Australia carried a Walrus amphibian. In mid-1944 Australia put her Walrus ashore as no longer required – the increased fitting of radar to Australian ships and the availability of land based Allied aircraft in greater numbers from forward bases, and at longer ranges, negated the need for RAN cruisers to carry their own aircraft. Two RAAF Walrus had been fitted with radar and operated from Australia and Westralia in 1942 and more replacement aircraft from the United Kingdom arrived in 1943-44 but they were no longer required at sea. Those larger ships that previously had an aircraft catapult installed, including the heavy cruiser HMAS Shropshire, had it removed and additional anti-aircraft guns fitted instead. The last known use of a Walrus by the RAN was in July 1944 when one was attached to the sloop HMAS Warrego for air sea rescue and reconnaissance duties in northern New Guinea waters. Warrego was too small a vessel to operate a catapult so the aircraft remained alongside the vessel and logistics support provided by Warrego. The aircraft was damaged on take-off on 30 July and craned on board the sloop for return to Australia for repair. It was unloaded at Bowen, Queensland in late October 1944. The RAAF continued to operate the aircraft for coastal patrols and air-sea rescue tasks until they were phased out of use during 1946. Left & Right: Supermarine Seagull V (Walrus) aircraft operating from Australian light cruisers in the late 1930's in Australian waters.